For Warhol and fellow Pop artists, reproducing images from popular culture was the visual means for expressing detachment from emotions, an attitude they regarded as characteristic of the 1960s. This painting by Andy Warhol, called the Sixteen Jackies. It was create in 1964, acrylic, enamel on canvas. 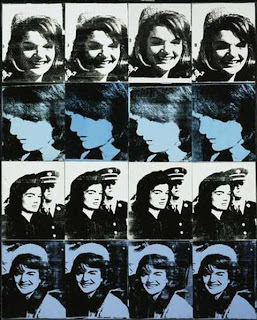 This is four images of Jackie Kennedy repeated four times, as a result from the 1963 assassination of JFK or her husband. 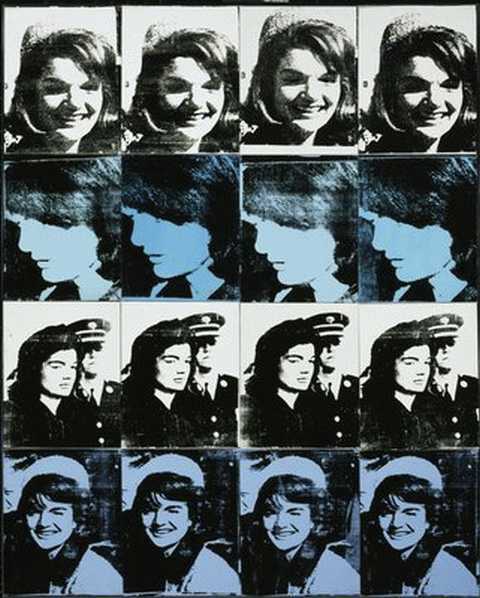 The reason I chose this image is because I adore Jackie Kennedy as well as Andy Warhol's work. It is so simple yet says so much. I also pick this painting because of the meaning that lies behind it. I just recently saw the home videos of the Kennedy's on TLC and I watched the assassination of JFK. It really took a told on me and I just felt that Andy Warhol just made such a powerful statement with this work of art.